Our readings this Sunday ask us to do the unthinkable, the nearly impossible - to "do good to those who hate you." It is an act only God is capable of (or those acting in the image of God). This is what Jesus commands us to do in today's Gospel. In our first reading (1 Samuel 26:2,7-9, 12-13, 22-23), we hear excerpts from the fascinating story of young David, who is being pursued by his former patron, King Saul. Saul and his army are trying to kill David. David stumbles on the opportunity to slay his would-be killer. He does not, recognizing him as "the Lord's anointed." In short, he does good to he who hates him, blesses he who persecutes him. In those days, Saul went down to the desert of Ziph with three thousand picked men of Israel, to search for David in the desert of Ziph. So David and Abishai went among Saul’s soldiers by night and found Saul lying asleep within the barricade, with his spear thrust into the ground at his head and Abner and his men sleeping around him. Abishai whispered to David: “God has delivered your enemy into your grasp this day. Let me nail him to the ground with one thrust of the spear; I will not need a second thrust!” But David said to Abishai, “Do not harm him, for who can lay hands on the LORD’s anointed and remain unpunished?” So David took the spear and the water jug from their place at Saul’s head, and they got away without anyone’s seeing or knowing or awakening. All remained asleep, because the LORD had put them into a deep slumber. In our Gospel reading (Luke 6:27-38), we hear a continuation of Jesus' Sermon on the Plain that began in last Sunday's Gospel reading. Here, Jesus lays out what it is to be a follower of Christ, in the image of God. Imagine how counter-cultural his words were to those who heard him; how counter-cultural they are even today. 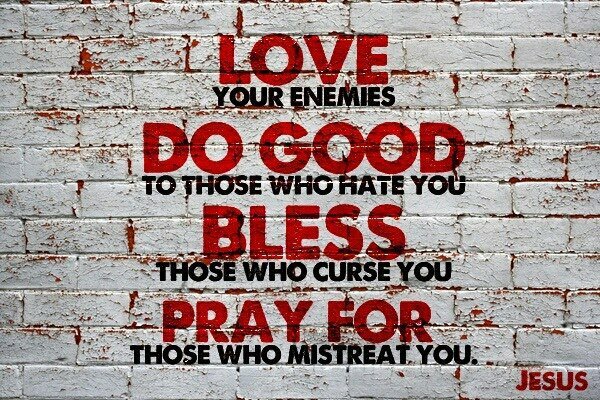 Jesus said to his disciples: “To you who hear I say, love your enemies, do good to those who hate you, bless those who curse you, pray for those who mistreat you. To the person who strikes you on one cheek, offer the other one as well, and from the person who takes your cloak, do not withhold even your tunic. Give to everyone who asks of you, and from the one who takes what is yours do not demand it back. Do to others as you would have them do to you. For if you love those who love you, what credit is that to you? Even sinners love those who love them. And if you do good to those who do good to you, what credit is that to you? Even sinners do the same. If you lend money to those from whom you expect repayment, what credit is that to you? Even sinners lend to sinners, and get back the same amount. But rather, love your enemies and do good to them, and lend expecting nothing back; then your reward will be great and you will be children of the Most High, for he himself is kind to the ungrateful and the wicked. Be merciful, just as your Father is merciful. In our Epistle reading (1 Corinthians 15:45-49) St. Paul contrasts (the first) Adam with the last (or second) Adam (Jesus). The first is from the earth, the natural world and the second Adam, Jesus, is from the spiritual world - the image of the heavenly one. It is this image that Jesus calls us to be in today's Gospel. Brothers and sisters: It is written, The first man, Adam, became a living being, the last Adam a life-giving spirit. But the spiritual was not first; rather the natural and then the spiritual. The first man was from the earth, earthly; the second man, from heaven. As was the earthly one, so also are the earthly, and as is the heavenly one, so also are the heavenly. Just as we have borne the image of the earthly one, we shall also bear the image of the heavenly one. Have you ever given a gift to someone and not received a thank-you? Were you offended? If the gift was truly given in the spirit of today's Gospel, with no expectation of return, there would not be offense, only love. The gifts given to us by God are not only with no expectation of return, it would be impossible for us to reciprocate with God. He gives purely because he loves us, over and over again. We are called to live in his image. This is, in the words of Bishop Robert Baron, "loving with a supernaturalized love." In the words of St. Ignatius of Loyola, "To give and not to count the cost."